For one to two months, Google is getting complaint about Google mobile ad. When users read news and do other things suddenly hands touch at bottom part. Now Google has made a vast change in their mobile ads work, in order to cure the so-called “Fat Finger” problem of users accidently clicking on ads while browsing on their phones and advertisers and consumers complaints the Google for worthless clicks while the latter is redirected to a website he or she doesn't want to be on those sites. Google announced the improvement in Google mobile ad now this issue is solve out by Google developers team. If any user clicks by mistake on the border area of a Google mobile ad, Google will ask you to click again to go website. 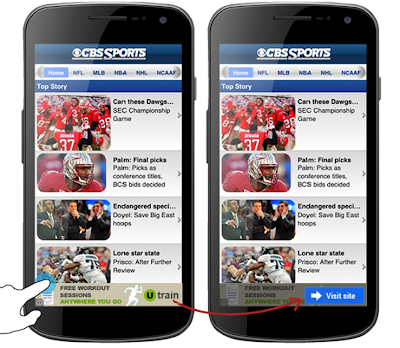 Google said that this feature is to prevent accidental clicks on mobile devices. I am very hoping then, Google new feature will be able to correct these problems and keep both parties satisfy and happy. Now everyone easily use their mobile handset and if someone click at the bottom then he know that how to rectify. Google has 55% market share in mobile ad revenue and 95% for mobile search ads. This statistics gathered by eMarketer. But Google is increasing their ad revenue, the amount that advertisers pay for each click is declining, in part because there are more mobile ads that are worth less.